All diseases start in the stomach! If you don't have a good digestive system, the rest of your body will eventually become malnourished and diseased. BE SURE TO WATCH THE DIGESTION VIDEOS AT THE BOTTOM OF THIS PAGE! 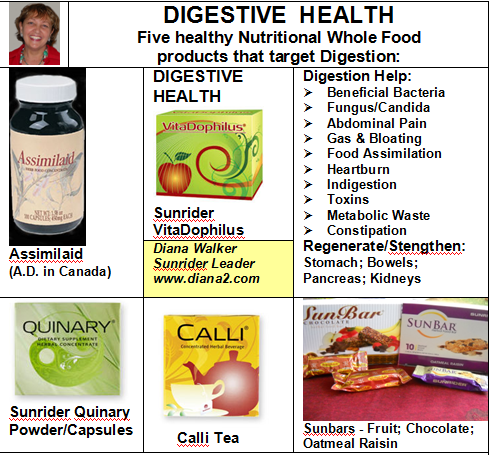 Click on the links below to discover Sunrider whole food nutrition products that will assist you in your digestive health journey. Choose health instead with Sunrider foods, whole natural plant-based diet, close to nature. More vegetables, fruit, nuts, whole grains, seeds. When we are young our stomachs should have a high acid content (digestive enzyme). This acid digests all the substances that we put into our mouths especially protein. Covering the inside of our stomachs is a mucous lining that keeps the acid from irritating the stomach wall. The more acid the stomach makes the more mucous the stomach produces. 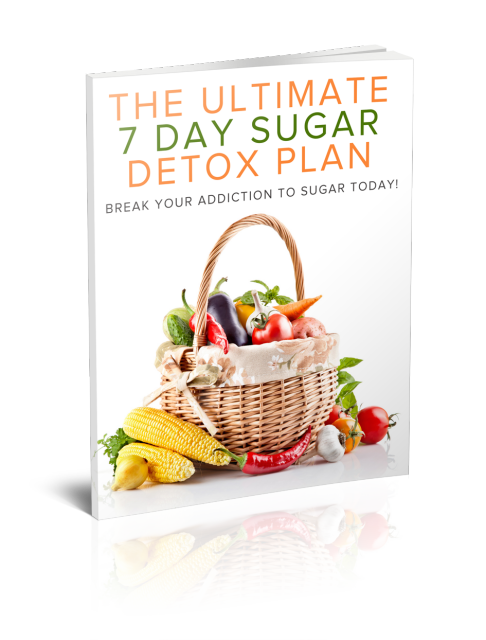 As we eat dead toxic foods, such as coffee, tea, chocolate, sugar, alcohol, artificial sweeteners, preservatives, salt, or tobacco (as most people have sometime in their life), the stomach is irritated and weakened to the point where it only produces a small amount of acid or digestive enzyme. This causes a decrease in the mucous lining of the stomach. The body's inner intelligence says, "Why make lots of mucous if there's only a little acid?" When this happens, irritation of the stomach lining occurs as acid levels are increased by certain foods resulting in heartburn and ulcers. If the irritation of the stomach continues, Hiatus Hernia will result from spasms and tightening of the stomach. A recent study showed that 50% of the population, by age 40, suffer from Hiatus Hernia. undigested proteins can show up as food allergies, the symptoms of which can be headaches, boils or rashes. As food passes or moves along into the large intestine, wastes accumulate and ferment. We are hosts to good bacteria as well as bad bacteria (often Candida). There are over four hundred different types of microorganisms found in the intestines, which all together are called the intestinal flora. Most of them are "friendly" aids, important to the digestive process. They make B vitamins and lactic acid for us which improve digestion, and increase absorption. As well, they aid peristalsis of the intestine and make Vitamin K. Vitamin K aids in blood clotting and helps produce chemicals that hinder the unfriendly bacteria. The problem occurs when we put the slow digestion together with the "bad" bacteria. Would you leave food lying around in a dark, warm, germ infested tub for a day or more? Many people don't have a bowel movement for 3 days or sometimes for even a week. and the bad bacteria would gladly digest anything remaining from your slow digestion process. As a result, the bacteria spew out up to 75 different toxins like ammonia, alcohol, and formaldehyde. So again, the weaker the stomach - the worse the fermenting process. All these nutrients and chemicals are absorbed into the liver. The liver's job is to filter out the poisons and neutralize them. This is where bile comes from - neutralized toxins. Wow! Isn't the body incredible - it takes something bad and turns it into something good. As well, the bile's job is to emulsify or break down fat. So if a person doesn't have healthy bile, the fat in your diet becomes more difficult to break down allowing it to be stored much more easily. When the liver becomes over-worked from too many toxins coming in, it starts to produce toxic bile. The body's response to toxic bile can be inflammation or hot spots in the duodenum, as well as the small and large intestines. Symptoms of this inflammation are known as colitis, Crohn's disease, duodenum ulcers, diarrhea and bladder infections, to name a few. As the liver becomes overworked, the blood becomes toxic. This is where signs of eczema, boils, arthritis, headaches, acne and poor mental clarity show up. As the toxic blood begins to pollute the body, the kidneys become over worked causing kidney infections and lymph problems to appear.